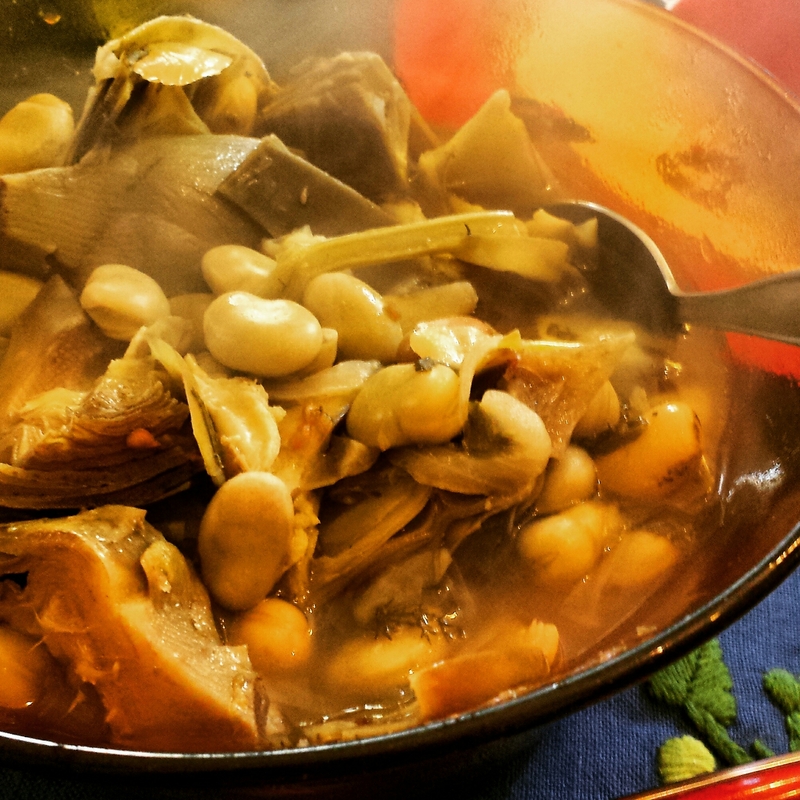 The staples of the spring table in Sicily are fava beans and artichokes. For centuries, fava beans were the protein foundation of “cucina povera” (“poor kitchen”) or the cuisine of the common man. Artichokes are plentiful this time of year, seemingly growing everywhere. This steaming dish if these two stars was made by my cousin Tanina during my last visit in February. It was so good. I would love to eat this dish for dinner this evening! I love beans (never had fava beans) and artichokes. Looks like they use the whole artichokes except for the leaves! Of course, I always scrape the little bit of artichoke goodness on the inside of the leaves. Yum! This is a very hearty and healthy dish. I’m waiting to get the full recipe from my cousin (another reader has asked for it). But yes, you can find fava beans canned in our supermarkets and artichoke hearts as well… certainly not the same as the fresh ones in Sicily, but it’s a start! Rosolare la cipolla tagliata sottile nell’olio e aggiungere i carciofi tagliati a piccoli pezzi. Aggiungere anche fave, finocchietto e piselli. Mettere sale e pepe quanto basta. Baci da tutti noi e buona preparazione! Brown finely chopped onion in olive oil; add quartered artichoke hearts, then fava beans, fronds of (wild) fennel, and peas. Salt and pepper to taste. Thanks for the recipe, Allison. I’m going to hunt down some fava beans. And fronds of wild fennel? Now that one should be interesting to find! You should be able to find fresh Fava beans. I did yesterday. Wild fennel, probably not. A good substitute is fresh dill. Thanks for the dill tip! And I’ll start checking Denver for fava beans. There’s a gourmet grocery in Denver (NOT Whole Foods!). I’ll start there.